Corporate Event at Slim's in S.F. 8 Track Massacre is a band that will take you on a musical trip back to the 1980's. You and your guests will dance all night to some of the greatest tunes of the decade...you may even find yourself onstage behind a mic! 8 Track Massacre is equipped with professional sound and lights for your venue and we are happy to work with you to make sure your dream event becomes a reality. From private parties, to clubs, to weddings and corporate events, 8 Track Massacre will deliver a high energy show your guests will not forget. An 8 Track Massacre show is high energy. Audiences will be singing and dancing all night to some of the best music of the 1980's. 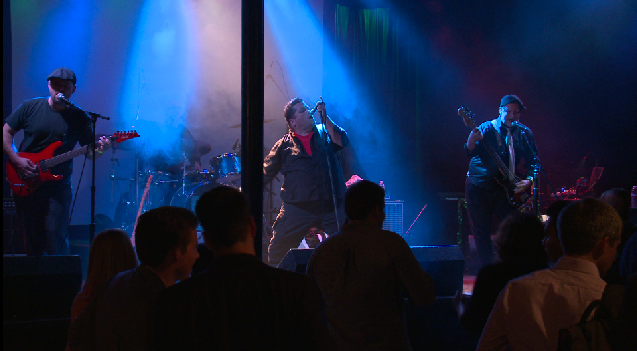 Some members of the audience may also find themselves onstage behind a mic belting out an 80's classic with the band! 8TM regularly performs sets up to 90-100 minutes long. The band's song list includes almost every genre from the 80's- new wave, rap, hair metal, and R&B. An 8TM show has something for everyone who knows and loves the music of the 1980's! -8 Track Massacre is an 80's cover band based in Sacramento, California. Formed in 2009, 8TM performs at weddings, private parties, corporate functions, and some of the best clubs in the Sacramento region. 8TM is a six member group, including a sound engineer. -An 8 Track Massacre show is high energy! The songs on the band's setlist are purposefully chosen to keep dance floors packed with happy guests. 8TM's setlist includes some of the greatest songs of the 80's by artists such as Depeche Mode, Billy Idol, The Cars, and Duran Duran. The band will gladly play client requests from its entire setlist- a fully customizable show! With adequate advanced planning, the band can also learn songs that do not currently appear on its setlist. -8TM is dedicated to bringing the vision of its clients to life. 8TM is equipped with professional sound and lighting suitable to most venues. Additionally, 8TM will gladly assist with MC duties for any event, provide customized break music, and assist with event promotion. The band is happy to work with event planners and wedding coordinators to ensure an event the client will always remember. -8 Track Massacre provides sound and lighting suitable to most venues. Our microphones are available for any announcements that need to be made during the event. The band also can provide a customized playlist of recorded music to be played during band breaks. 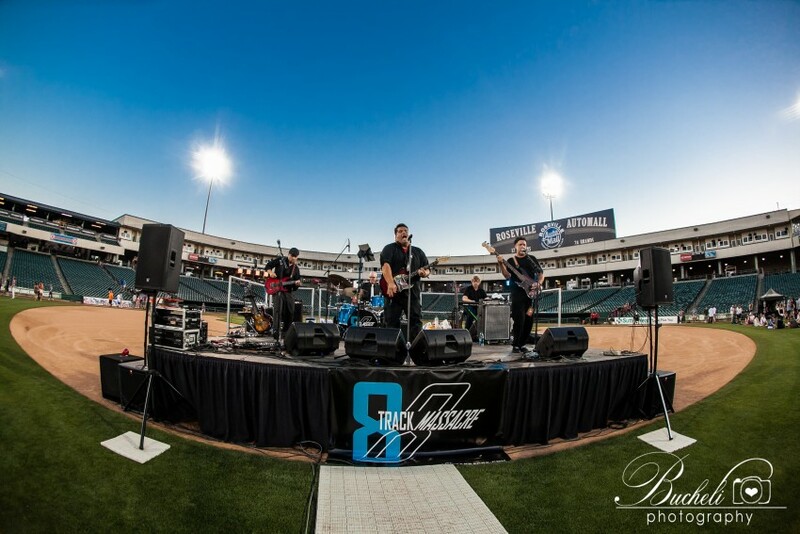 -8TM does require a stage or paved surface for ANY outdoors venue. -For ANY DAYTIME EVENT, shade structures must be provided to protect musical instruments and sound equipment. -8TM requires ready access to power for amplifiers and sound equipment. -8TM requires load in vehicle access to the stage for any event. For events in public venues, parking for band vehicles must be provided. Elvis Costello- What’s So Funny ‘Bout Peace, Love, and Understanding? Men at Work- Who Can it be Now? 8TM is influenced by many of the greatest acts of the 80's: Duran Duran, Depeche Mode, The Cars, Billy Idol, The Cure...and Spinal Tap!